Hans Kristensen’s address to the Standing Committee on Agriculture and Agri-Food (AGRI) during their study of Climate Change and Water and Soil Conservation Issues, on Wednesday, February 7, 2018, in Ottawa. Good afternoon my name is Hans Kristensen. I am a hog and poultry producer from New Brunswick and the 1st Vice Chair of the Canadian Pork Council. I would first like to thank the members of this Committee for the invitation to appear before you to discuss the study on Climate Change and Water and Soil Conservation. Like all Canadians, hog producers are concerned about the implications of climate change and what impact we, as food producers, have on the soil and water resources that we depend upon. Climate change is not a theoretical challenge for us. It impacts the crops we grow, the facilities that we use to protect our animals and the plant and animal diseases we face. Often, we live on our farms and more often the not, success is measured by our ability to transition our farms from one generation to the next. In addition to these larger considerations, we also face the practical reality of having to compete every day in the global marketplace. Canadian pork producers export almost 70 percent of what they produce. We operate in a very competitive global environment and one our key advantages is our access to high quality soils and ready supplies of water. We are well aware of the importance of these resources and, as a result, we work hard to ensure their long-term availability. The necessity of being globally competitive means that we must continually focus on producing more pork utilizing less land, water and energy. In addition, hog producers are keenly aware of the importance of maintaining the trust of Canadians – all Canadians, not just those that consume our pork. What this means is that producers are under tremendous pressure to not only be stewards of their environment, but be seen to be environmental stewards. We accept this challenge and have started to closely track and our progress. For example, Quebec producers are now routinely monitoring their progress. In four short years the amount of water used to produce a kilogram of pork has declined by 1.7%. Quebec producers have also benchmarked their sector against global producers and found their carbon foot print is 31% less than the global average. 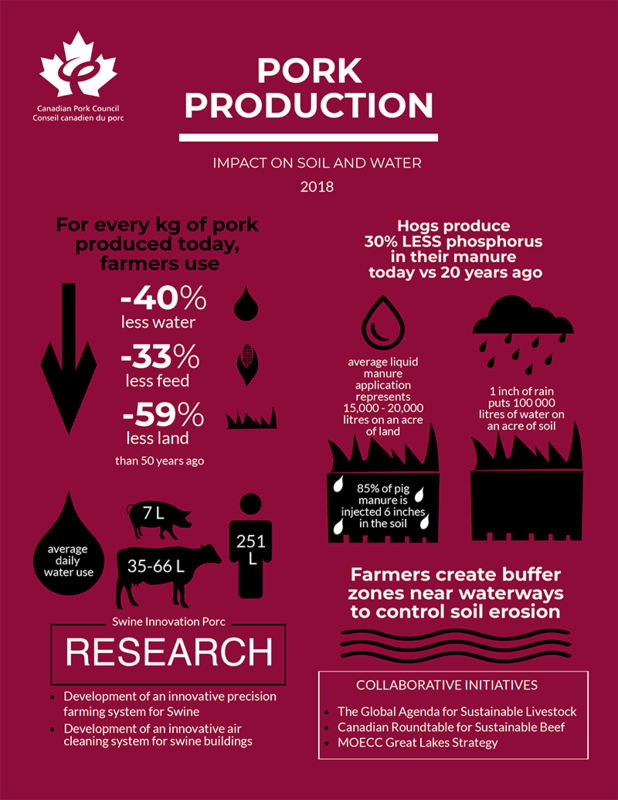 US research shows that American hog producers, who utilize production systems similar to those employed in Canada, have over the past 50 years decreased the natural resources consumed by pigs by 50% per kilogram of pork produced. Farmers are using 40% less water, 33% less feed and as much as 59% less land. At the national level the Pork Value Chain Roundtable will be building on the work undertaken at the provincial level to complete a Life Cycle Assessment of Canada’s pork industry. Over the years we have embraced a number of different initiatives – often in partnership with federal, provincial and/or municipal governments. An early example of this was the adoption of Environmental Farm Plans. The Environmental Farm Plan is an assessment completed by farmers that is aimed at identifying and mitigating potential environmental risks on the farm. These plans, coupled with technical and/or financial incentives to address identified challenges have served to not only raise awareness of the issues at the farm level, but also implement actions to address them. It is a classic example of thinking globally and acting locally. An area where our industry has gone to great lengths to develop science-based practices to reduce our impact on soil and water is in the management of hog manure. The application of hog manure to farmland is an economical and environmentally sustainable mechanism for increasing crop yields by providing inputs of nutrients and organic material. Nutrients in hog manure can replace chemical fertilizers – resulting in decreased greenhouse gas emissions associated with the production of these fertilizers. However, the value of manure is more important than the accumulated value of the individual nutrients. Hog manure is an excellent soil amendment that improves soil quality. To help maximize the value of hog manure, producers across Canada develop nutrient management plans. These plans, developed with the guidance of soil and water experts, ensure adequate manure storage is available and that manure is applied in a manner that most greatly benefits the land. In many parts of Canada, producers use an injection method when spreading manure. This direct injection into the soil ensures the maximum utilization of available nutrients by the crop. Government financial support, often linked to Environmental Farm Plans, has been very effective in helping to implement actions to better manage the storage and application of manure. Producers are also working closely with government to identify watershed-wide solutions to managing water quality. As an example, Ontario producers are actively engaged with Government of Ontario officials and other agricultural industry stakeholders on the Domestic Action Plan for the Great Lakes Watershed. However, there is more work to be done. For this reason, producers are partnering with governments and investing heavily in research and development. As an example, close to half of the carbon footprint associated with raising pigs comes from the process of growing the crops the pigs eat. Improved feed efficiency provides a tremendous opportunity for reducing the overall impact of pig production and the number of acres needed to feed pigs. Research projects are underway that look at virtually all components of the question from identifying animals with superior genetics to the use of probiotics to help improve nutrient availability. Efforts to identify practical methods that will lead to improved feed, water and energy efficiencies are also in place. Given the importance of innovation we are very pleased with the Government of Canada’s focus in this area. Canadian Pork Producers look forward to the roll out of the new Canadian Agricultural Partnership. Thanks to the AgriScience program, hog producers will be able to continue their long-term partnership with Agriculture and Agri-Food Canada in utilizing research to address the fundamental challenges facing our industry. In the case of pork, our research efforts are quarterbacked by Swine Innovation Porc. Swine Innovation Porc, operates from an office in Quebec City, and facilitates research in the Canadian swine sector. Its main objective is to enhance the profitability and sustainability of Canada’s pork industry by supporting the development of the most innovative technologies that will benefit the pork value chain. While the pork sector has benefited greatly from the science cluster initiative, we are limited in the resources that we can bring to the table. In 2016, the Canadian Pork Council completed the public process to establish a Promotion and Research Agency. Creating an agency would provide producers with a new source of industry funds that could be used to expand our innovation program. We look forward to the Government of Canada completing its review of our application and taking the measures necessary to establish the agency. Huge strides are being made in tackling climate change as we are continuously improving the efficiency and environmental sustainability of our production, reducing greenhouse gas emissions by adopting innovative health and husbandry practices, adapting tools that support sustainable and environmentally responsible production and utilizing less resources. These initiatives are lessening the environmental impact of pork production. Thank you once again for the opportunity to appear before you today and speak on this important subject.